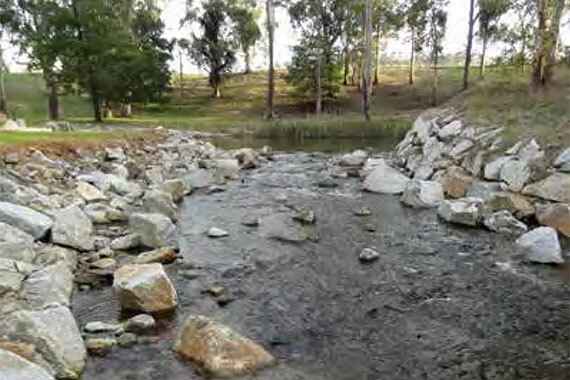 Platypus and the threatened fish Australian grayling thrived in the Tarago River in 2014–15 following environmental watering. Environmental water was delivered throughout the year to maintain and improve aquatic species habitat, help native fish breeding and migration and maintain habitat connectivity for blackfish, platypus and macroinvertebrates. In an Australian first, Melbourne Water acoustically tracked platypus in the Tarago River during environmental watering. Sarah Gaskill, Environmental Water Planner, said, "Low water levels before the environmental watering decreased platypus habitat availability, reduced connectivity along the waterway and increased predation risk. These conditions appear to inhibit platypus movements. "During the environmental flow release in autumn, our acoustic tracking indicated that platypus increased their activity and movements in response to increased flows." Monitoring also showed that Australian grayling spawned following the autumn environmental flow. "We also acoustically tracked Australian grayling to get an indication of their movement in response to the environmental flows," Sarah said. "Nearly all of the 25 tagged fish migrated downstream – some almost 50 kilometres – to the lower part of the Bunyip River near Koo Wee Rup." "One of the fish then returned all the way back upstream to where it was originally collected – a round trip of close to 100 kilometres." Platypus were also tracked in rivers in the Wimmera.